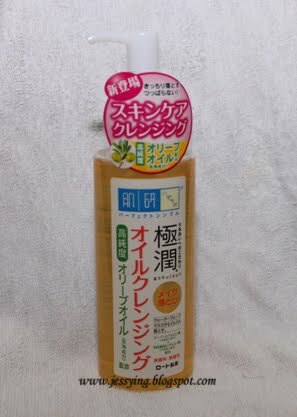 Hada Labo Super Hyaluronic Acid Cleansing Oil has hit the store for about a month or two. It contains high purity olive oil as their main ingredient ands their signature Hyaluronic Acid which suppose to hydrate skin and will not skin feel dry after using it. The instruction and ingredient in Japanese. Well it promises no parabens, mineral oil, fragrance, alcohol and coloring. And I love it when there is no mineral oil because mineral oil tends to clog my pores ! And this definitely is a good try for people with sensitive skin and wants to something which is mild for their face. The cleansing oil comes with clear liquid although it looked yellow from the bottle. Even though this consists of olive oil extracts, the texture of the cleansing oil is light and it reminds me of my Kose Sofymo cleansing oil . However the later on has mineral oil as its main ingredients. Review : I pumped a full pump of the cleansing oil and massage it on my whole face (remember to close your eyes when you massage on it) for around 2 minute and slowly added in water to emulsify the oil until it turned milky. It cleansed up my makeup quite well including waterproof mascara too, however do note that I need to massage a little bit longer on my eye area when I am applying heavy eye makeup. And even when the cleansing oil gets into my eyes, it does not sting my eyes. And my face feel soft, not feeling dry after using it and best of all it does not clog my pores because it does not have mineral oil. And I do think I will re-purchase this! Hada Labo Super Hyaluronic Acid Cleansing Oil 200ml is selling for RM49.90 at all leading pharmacies now.